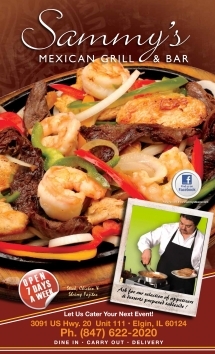 Our original Mexican and Latin menu is comprised of authentic favorites of freshly smashed tableside guacamole, seafood ceviche, salsas, and main dishes of steak, chicken, pork and seafood including the Grandma family recipes. Sammy's Mexican Grill menu also offers the classics: Burritos, Enchiladas, and Fajita's including our specialty Cochinita Pibil Yucatan style. Our Bar shakes up refreshing margaritas and cocktails including masterfully muddled margaritas made with the tequila of your choice so don?t wait more come and try it.